After reading about the short lofts on the Simpson synthetic being less than ideal for many users, I am looking into having Rudy Vey make a brush for me using a 25mm Muhle V2 knot as I have read he has these available. If the Simpson testers felt 54 was a good height for the chubby, would that work well for the less dense Muhle knot? If I order one, I might have Rudy just drill the hole and do my own experimenting on loft height until I get it to where I feel it is just right for me. 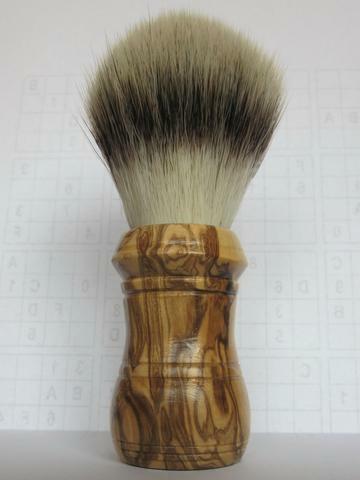 I would think that a good loft for a Muhle 25mm synthetic would be in the mid-to-high 50's (Muhle's brush is 62mm). However, I would first discuss the issue with Rudy after advising him of you shaving preferences. (04-04-2014, 06:03 AM)branford Wrote: I would think that a good loft for a Muhle 25mm synthetic would be in the mid-to-high 50's (Muhle's brush is 62mm). +1 Great advice, here! Best of luck. This brush performs well at everything - face or bowl lathering, creams or soaps. 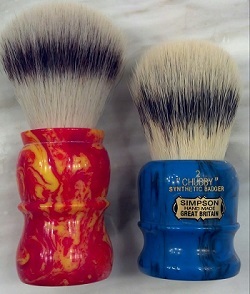 By the way, the Simpson Chubby 2 synthetic also performs great, but it's a totally different brush. If you go over to Badger and Blade, jeff2011 posted a thread today about his new RV custom with a 25mm Muhle synthetic knot also set at 55mm. Thanks, I have been exchanging emails with Rudy and he says 55mm is where he has been setting the loft and it seems everyone is happy. I'm putting together an order with him. Your brush is a looker. Rudy does great work. Your Simpson isn't too shabby either. Very nice brushes. I use two Mühle STF V2 as my travel brushes and decided to skip badger brushes for travel. One is the 23 mm the other is the 25 mm. My Pur-tech in 28mm has satisfied me more than 24-25mm synthetics that i had. Expecting a 23 mm black fibre knot from Muehle - what loft should I set - 51 mm ?